I dipped back into the archives tonight for this post. The pictures here were taken 13 years ago back in March of 2000 with an old digital camera that saved the pictures on a floppy disk. As you can imagine the picture quality is not that good. I am not sure why my mind wandered this way, but I was thinking of Castle Rock this evening. Years ago I had a calendar of natural wonders of Kansas and there was a picture of this formation for one of the months. I knew that someday I would have to visit it. While on a trip to Colorado Springs from Kansas City where I lived at the time I stopped by to take a look. On the same trip I also visited the last few counties in Kansas that I had not visited. 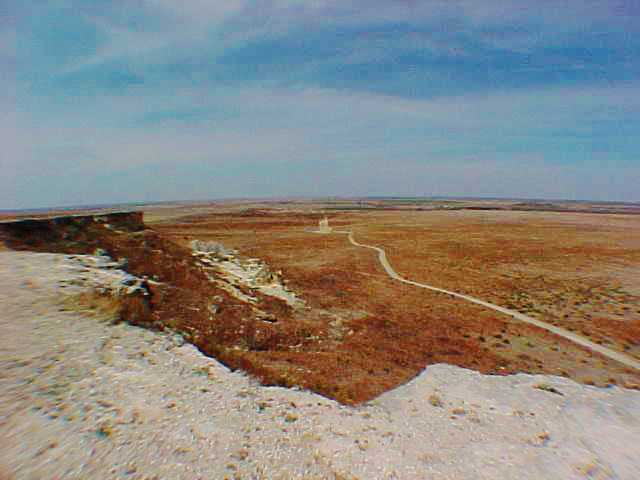 Castle Rock is about 15 miles south of Interstate 70, which is built across the flattest part of Kansas. However, once you get off the interstate the landscape changes. In the picture above you can see Castle Rock off in the distance. The formation is a little hard to see, but I wanted to give you a good impression of how it is located in the middle of a large flat area. Also located near the formation is an area of badlands that are carved out of limestone. 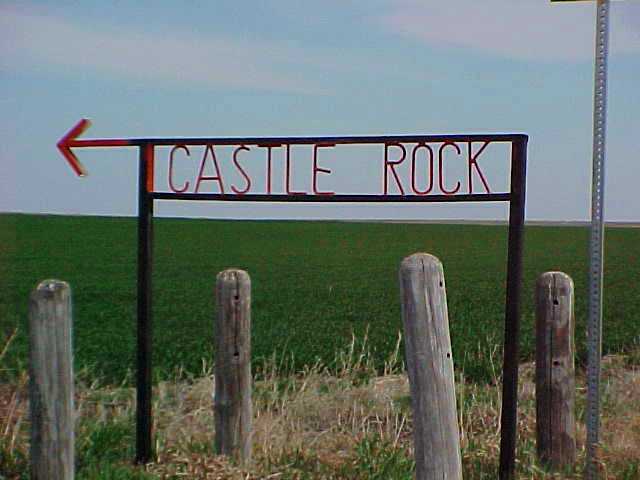 Castle Rock was located along one of the Old West stage routes and was a familiar landmark. Of course, the name comes from the fact that the formation resembles a castle. I was fortunate to visit Castle Rock before 2001 as the tallest spire lost the top part just after a summer thunderstorm. Visiting Castle Rock was quite an experience and is a place that I would like to visit again some day. Without the tallest spire the limestone formation is now about 70 feet tall. It was impressive to look up at this formation and image how it was formed and how it had weathered over time. I hope you enjoyed these old digital pictures and a peek at this seldom seen Kansas landmark. Unfortunately it is not quite as impressive today as it was at this time. This entry was posted in Memories, Travel and tagged Badlands, Castle Rock, history, Kansas, Limestone Formation, memories, nature, Quinter, Rock Formation, Stage Coach, travel. Bookmark the permalink. I’ve made the drive from Kansas to Colorado several times and can picture the terrain along Route 70. This post makes me want to get off the highway and explore the surrounding area a little. I’ve always enjoyed seeing tourist attractions and geographic formations that are off the beaten track. There: history and geology all rolled into one. Great post, and now I hope I see Castle Rock one of these days. The thought of all those coaches, rattling past, day after day…. That’s interesting topography isn’t it? We have an area in Alberta called The Badlands. It’s near Drumheller, Alberta. Famous for all the fossils of Dinosaurs that have been un-earthed there. The museum is really interesting as is the coal mining museum in an abandoned town near by. 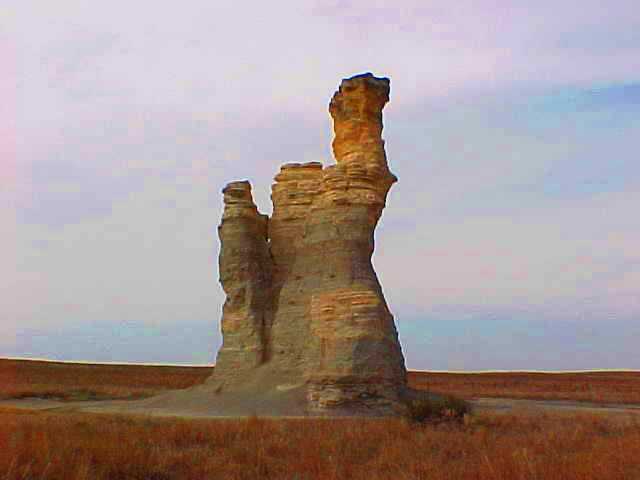 They also hype the Hoodoo’s which are rock formations similar to Castle Rock.